Funky Seventies will take you back to the 70s – the decade that saw the rise of funk, punk rock and disco music. 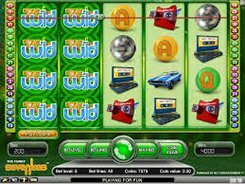 The slot features 5 reels, 4 rows and 40 bet lines. Before any spin you can adjust a coin value ($0.01 to $0.5), the number of coins per line (1 to 5), and the number of bet lines you want to have in play, thus the top stake reaches $100 per spin. Being evocative of that time, the symbols are a legendary Dodge Challenger, a disco ball, platform shoes, and other themed icons; these are joined by standard poker cards from Jack through Ace. The logo acts as a wild that substitutes for other symbols and appears stacked on all reels. Besides, a wild is the biggest payer in the game awarding up to $2500 for five of a kind. 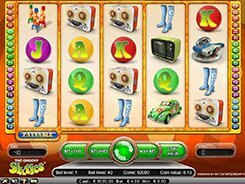 A free spins feature is activated by three or more scatters occurred in any spot. You get 5 retriggerable free spins at a x2 multiplier regardless of the number of scatters that have activated the feature.